Air Tech has earned a solid reputation from building strong relationships with our local customers. Based on trust and dedication, our highly skilled and licensed plumbing services technicians in Manahawkin, NJ will handle any job – big or small. Approaching every job with the expertise and professionalism our customers deserve, we take pride in solving plumbing problems in the most efficient way possible. We know every customer has unique needs, so we make sure those needs are given the attention they deserve. We are proud to be your local, family-owned plumbing services experts in Manahawkin NJ. Air Tech has been providing residents of Manahawkin NJ and surrounding areas with affordable, flat-rate plumbing services since 1999. Offering a wide variety of high-quality plumbing repair services and custom installations, our mission is always to get the job done right the first time, delivering the most superior plumbing services to our customers. Whether you’re remodeling the kitchen, repairing a pipe leak or replacing the water heater, our expert plumbers have you covered. Air Tech management and staff are proud to be your one-stop commercial plumbing services contractor. Whether you’re facing toilet repairs, fixture replacements or water heater issues, our highly-skilled plumbers can handle any size job. With a large inventory of supplies and equipment in stock, we are prepared to complete your job on-time and on-budget. Always striving to exceed our client’s expectations, if you’re looking for a commercial plumbing company in Manahawkin NJ that offers reliable, cost-effective services, Air Tech is the best choice. When it comes to plumbing emergencies, they can happen at any moment day or night. From clogged drains and flooding to water leaks and broken pipes, our team of highly skilled professional plumbers are on-call 24 hours a day, 7 days a week to help you with any plumbing emergency in both residential and commercial locations. Go ahead, put our number on speed dial: 609-222-4519 and flush all your plumbing worries down the drain. 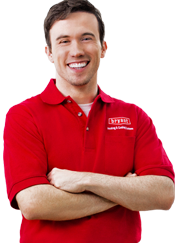 We also offer a variety of maintenance plans for plumbing service to cover all our residential and commercial customers. These plans include gas or electric hot water heater equipment service and/or whole house coverage which includes one kitchen, three bathrooms and one hot water heater. How hot should my hot water heater be set at? The new temperature standard that most manufacturers use when pre-setting a hot water heater is typically 120°F – this is actually recommended by the EPA (Environmental Protection Agency). OSHA (Occupational Safety & Health Administration) recommends setting your water heater thermostat at 140 degrees under certain circumstances. Adjust the temperature to meet your needs, keeping in mind any small children at home. How will I know if roots get inside my drain lines? If left untouched, roots from trees and plants can potentially fill a pipe with hair-like masses at the point of entry. These masses lead to clogs from tissue, grease and other debris that flows from your home to the main sewer. At first, you’ll notice a reduced flow which can lead to a complete blockage and even a broken pipe. Air Tech uses state-of-the-art drain cameras to view the inside of your pipes and inspect for any drain damage due to roots. My pipe suddenly burst in my home/business! What should I do? If you experience a burst pipe in your home or business, the first thing you should do is find the water main and shut it off immediately. This will prevent more water from spraying out of the burst pipe and minimize flooding damage. Next, call the professional plumbers at Air Tech to get the situation under control. How do I protect my home through New Jersey’s cold winter? Freeze and thaw cycles can damage pipes if they’re not properly protected. While we’re always available for emergency repairs, we prefer helping you to prevent any problems with proper winterizing. When it’s time to leave town for the winter, give the Air Tech Concierge Program experts a call to winterize your property and rest assured that you’ll return to a damage-free home come next spring.